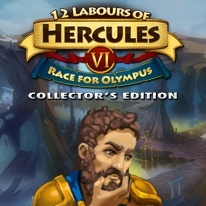 Help Hercules find the true leader to rule Olympus! This time, Hercules and Megara are involved in the detective story. Alarm at Olympus is showing the absence of Zeus, who rarely left the peak. A few clues reveal the fact that Zeus has been abducted.Hercules and Megara begin the investigation. The snowy peaks are cold as hell, so the first thing will be to get dressed according to season. The game introduces new landscapes, underwater levels, ice skating workers, volcano, funny puzzles, and many more.